Opossum Bay is located on the Derwent River, just 40mins drive from the centre of Hobart. "Seaside Retreat' is a reminder of happy beach holidays from childhood days, and echo from a less complicated and stress-free time of our lives which we might want to re-capture or share with our own children. Open the door and across the road is pristine sand lapped by crystal clear water, this place offers a haven from the fast pace of 21st century living. The beach is dotted with beautiful seaside properties. Families and young children enjoying the day, small boats floating about. Bliss! The shack itself has a true happy warm holiday feel. Fresh bright linen, comfy beds (views from each bedroom window), self contained kitchen to prepare your tasty Tasmanian produce accompanied by a fine Tasmanian wine. The toilet is a step back in time - and a step outside! Yes please note it is an outside toilet! Stroll to the beach, stroll to the local shop for some fish n chips, or try your luck and fish off the jetty (you will need to bring your own rod). If this is the kind of relaxation that meets your needs then Seaside Retreat is your cup of tea. General goods provided - books/magazines, coffee maker, dining dishes and utensils, fireplace, heating, iron and board, lawn/garden, linen provided, microwave, outdoor grill, oven, pantry, fridge, stove, television, hairdryer and toaster. On vacating please have the dishes in kitchen washed dried and put away (so no ants flies etc gather). Any excess sand that has entered the property please vacuum. This would be very much appreciated. Please contact owner of property 24hrs prior to checkin time to obtain access code. To do this you will need to contact stayz and they will contact me directly (Stayz wont allow me display my mobile number). 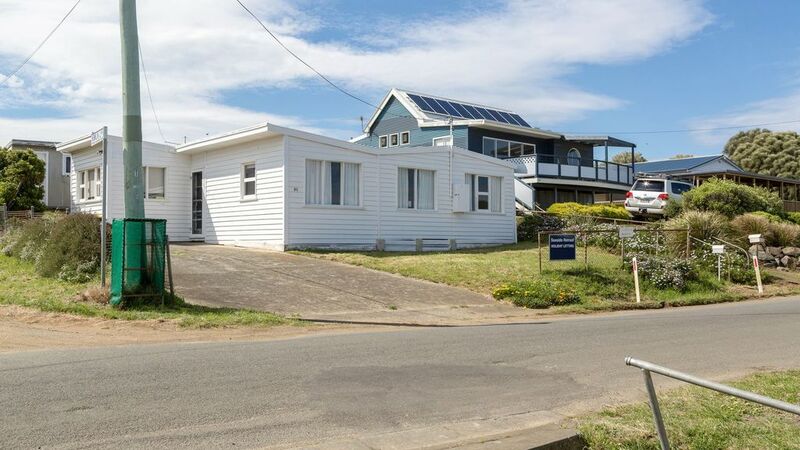 A+ location, just steps from the public beach access, lovely water views, cute basic original shack. Toilet was outside in shed, but wasn’t much of an issue as we only stayed for one night. Very clean and tidy. We’d definitely stay again. Great location. Comfortable beds. Easy access to the beach. Options provided aren't really accurate. We enjoyed our stay but felt for the money paid the house & service were a bit ordinary. I loved the lounge area and how it opened to the kitchen & we loved the proximity to the beach. The beds were comfortable and linen fresh, however I had some form of dust/grit all over my bedside table. swelling chipboard covering the hot water system. The shower curtain also needs replacing. We also thought a bread knife would be standard utensil to have but there wasn't one. Floors are also quite uneven so wouldn't recommend for anyone who is unsteady one their feet. Can't fault the position...the view...and how easy it was to book and gain access. As I said...enjoyed our stay but for the nightly rate expected a higher standard. We have since stayed in other Tassie locations, paid less per night and rexieved much more for our money. Great to hear you loved the location & views - we do to! So much to love! Sorry you felt some "negatives" towards our family holiday shack that we love to have available to others, so they too can enjoy all that Opossum Bay offers! It's very simplistic place to stay. Agree there are some better accom, some worse, but we take much pride in what we offer. We have addressed the knife situation. The shower curtain is new. Sadly (or happily) being an almost beachfront property there will be some dust, sand or as you put it grit (thats part of beachfront lifestyle) and natural parts of earth will enter 24/7 but we do our best to keep on top of that. The other structural things (floors) will be looked at and if deemed dangerous most certainly will be attended to. Service is prompt and friendly - we always accommodate early check in when possible along with a late check out when possible to ease your stay without pressure! If you wish to discuss further privately please do. Fabulous location across from the beach, everything you need for a relaxing holiday! This was a great place to quickly recharge and stroll along the quiet beach. The shack has just about everything you need for a relaxing stay. Thanks Shane glad you enjoyed your stay yes the beach is such a beautiful part of the stay. Its a very simple easy shack with not a care in the world! Right by the beach, kid friendly! Thanks, we had a great stay. Everything we needed was provided and it was a nice little holiday shack. Very comfortable and the views and beach were superb!